Have you always been a bit of a foodie? Do fine foods and fresh produce bring you joy? 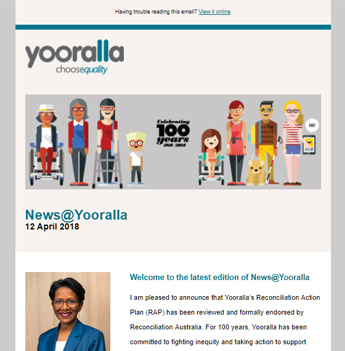 Yooralla Catering is an exciting initiative that provides employment and industry supported training for people with a disability, creating opportunities to achieve greater independence, choice and confidence. Do you need catering at your next function? At Yooralla Catering we provide high-quality, fresh food that’s lovingly prepared by our enthusiastic team using only the freshest ingredients. From board meetings, corporate lunches, canapés or party platters, our team has your event covered. Better yet, we'll happily deliver your order free of charge if you are located within 10kms of Melbourne's CBD, and your order is above $150.00. Call us today to discuss tailoring a package for your next function - or use our online order form to place your order now. Please provide 48-hours’ notice for all orders. Working in a supported employment position at Yooralla Catering, you can get on-the-job training in food preparation, food hygiene and serving meals. You’ll be working with an enthusiastic team, producing high-quality fresh food for events such as board meetings, corporate lunches and parties.